Kenneth Morgan was the youngest son of William Thomas and Sarah LoVina Ross Morgan. He was born October 1905 at Neeley, Idaho and married Mary LeRosa Finn in 1925. 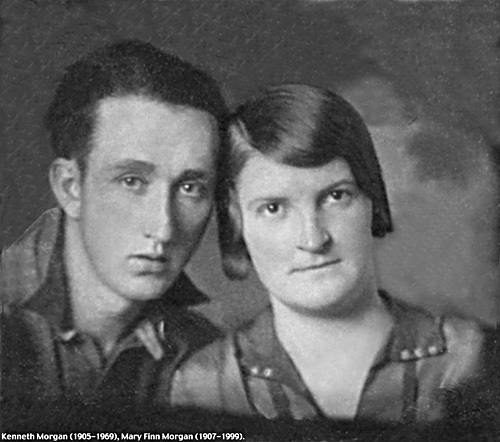 Above....Kenneth and Mary Finn Morgan somewhere around the time they were married (1925). Below: The earliest family group picture we have of the Kenneth and Mary Finn Morgan family. 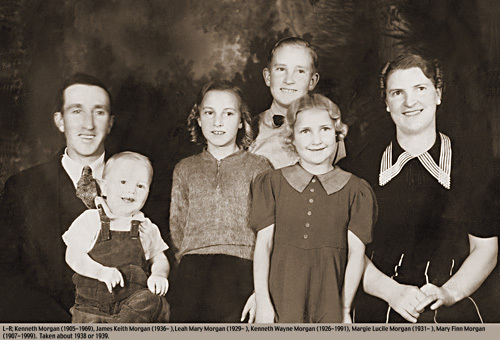 The Kenneth and Mary Morgan family in 1937. Back row: The oldest son Kenneth Wayne Morgan (1926-1991). Middle Row: Kenneth Morgan (1905-1969), Leah, Margie and Mary Morgan (1907-1999). James Keith Morgan on Kenneth's lap. 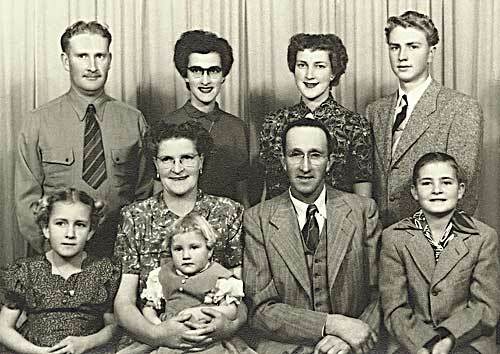 The Kenneth and Mary Morgan family in 1943. Back row: Leah Mary Morgan, Kenneth Wayne Morgan (1926-1991), Margie Lucile Morgan. Front Row: Morris Brian Morgan, Kenneth Morgan, James Keith and Mary Morgan. 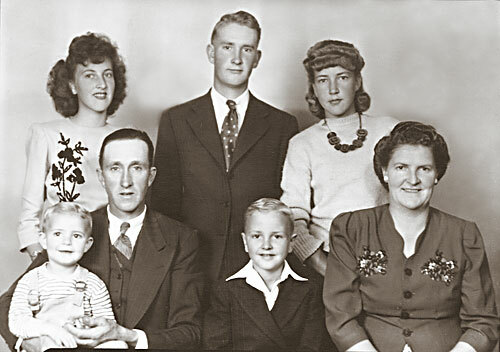 The Kenneth and Mary Morgan family in 1952. Back Row: Kenneth Wayne (1926-1991), Leah Mary, Margie Lucile, James Keith. Front Row: Judy Sarah, Mary Finn Morgan, Kenneth Morgan, Morris Brian. Click on the link above to be taken to the pictures and life history for Kenneth and Mary Morgan's oldest son Kenneth Wayne Morgan. Click on the link above to see Mary Morgan in a large picture of the Rigby Second Ward mothers taken in 1954. Click on the link above to see a picture of a wool and cotton quilt made by hand by Mary Morgan in about 1925. Click on the link above to see an old picture of Kenneth Morgan, his brother Alvin Elmer Morgan, and a group of men on horses.